KOSSA had it somewhat easy against Koloale who were but shadows of the side that reached the grand final in the 2010 edition of the Our Telekom National Futsal Championship. The defending champions finished Koloale off by 7 goals to 1. Dennis Ifunaoa, was the star for KOSSA on the day with his hat trick and a performance that surely will catch the eye of national selectors. Ex-Koloale player, Dickson Ramo, made matters worse for his former team when he scored and Matthias Saru added his single strike. National player, Coleman Makau scored twice for KOSSA. Koloale’s lone goal came from Jeffery Bule. Midway through the game things turned controversial when a misunderstanding about the playing rules almost saw the match halted. Fortunately, the issue was overcome when the referees explained the matter to the players of one team. The second semi final was a closer tussle between Marist and Brisolona but the latter eventually pulled away to win the context by 8 – 3 in extra-time after the scores were level 3-all at fulltime. The goal feast proved to be a winner for the spectators who lined the sidelines to watch the game. Elliot Ragomo opened scoring for Brisolona with a lovely show of control before sending the ball past a defender and then the goalkeeper. The national team captain would score again and with the help of Matthew Hania took the half time score to 3 – 1. Paul Hiri scored Marist’s only goal of the first stanza. The second half was completely Marist’s as they scored twice to take the scores to 3-all at full time. Henry To’o dazzled the Brisolona defenders and the spectators with some fancy footwork before sending the ball beyond the reach of Paul Huia. Jerry Sam made sure the game went into extra time with a long distance free kick that levelled the scores. Extra-time was a totally different story as Marist broke down and allowed Brisolona to score unanswered 5 times. Ragomo completed his hat trick and Robert Laua, George Basi and McPhillip Aisa added 1 each. The final say came from Hania who put in the final goal of the day to cement Brisolona’s claim to the second grand final spot. 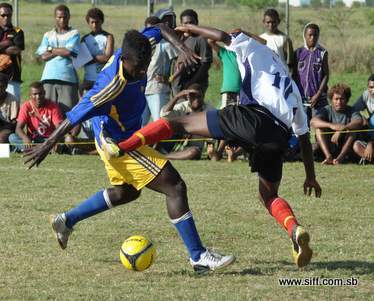 The losers final will kick off at 2pm at the Solomon Islands Football Federation (SIFF) academy south court tomorrow. The grand final will follow at 4pm at the same venue.